Today we’re kicking off a brand new segment around here with a focus on happiness! Inspired by my friend Annie & my favorite podcast, each Friday I’ll be talking about what’s making me happy that week. NPR’s Pop Culture Happy Hour | I’m about four full episodes behind right now, but there is absolutely nothing better to listen to during my commutes. I’m not usually too keen on listening to people talk in the morning (I’m looking at you radio hosts) but the folks from PCHH are an absolute joy to listen to. I feel like I need to take notes on each episode because there are so many good recommendations! Subscribe on iTunes. Bill Cunningham New York | I smiled the entire way through this documentary. I love Bill Cunningham’s photographs and this provided a small glimpse in the way he sees the world and fashion. Anna Wintour says it best: “We all get dressed for Bill.” It’s on Netflix & should be added your list immediately if you haven’t seen it yet! 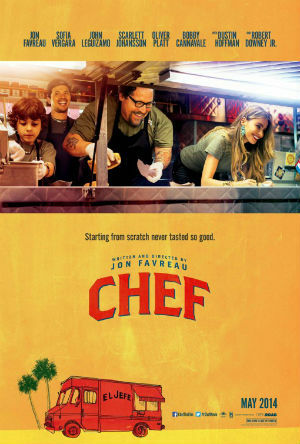 Chef + Soundtracks | I first came across Chef on Netflix, saw it was a movie about food and thought it looked like one the entire family might enjoy (easier said than done!). Little did I know how great this movie would be. Or how much I would love the soundtrack. Both the movie & soundtrack are just so much fun. I love a good success story and the cooking and love of food throughout the film certainly don’t hurt. This movie has not one, but two soundtracks – there’s so much good music in the film! They’re perfect to listen to at work because they are so upbeat and mostly instrumental. Check out the soundtracks – volume one and volume two. P.S. What’s making us happy this week is a segment on each episode of PCHH – it offers some of the best recommendations!